Save time with our Online Canteen!! Robina State School accepts orders using MunchMonitor. Our menu has been designed to meet the requirements of the Smart choices – healthy food and drink supply strategy for Queensland schools. We serve foods from the green or amber categories. Several days a year we have special ‘red’ days. 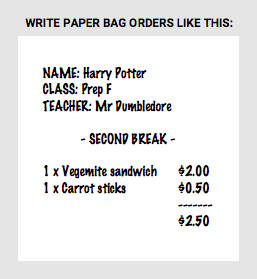 More information can be found in our Tuckshop menu (link on the right). This is also available from the school office. Find out more about the Smart Choices – Healthy Food and Drink Supply Strategy for Queensland Schools. You can assist the school by volunteering to help on a regular basis. We cannot function without the support of parents who are willing to give their time to serve the children. Being on the Tuckshop Roster can also be an important social outing and an opportunity to meet other parents. To volunteer, drop in and see our convenor Janine or one of the ladies at the tuckshop. You can order easily online using Munch Monitor.